Sitting at home in Missouri, it’s easy to say ‘I’m out of ‘x,’ let’s run to the store and pick it up.” Case in point, before leaving for this trip, I spent some time with friends. At the last minute, we decided to make hot-fudge, brownie sundaes. There was only one problem with our plans, we needed chocolate and whipped topping to go with the brownies and ice cream. So, without giving it much thought, I volunteered to make a “run” to pick up the missing ingredients. An hour later, after the brownies came out of the oven, we were munching on the treat. While most Brazilians have small grocery/bread/ice cream/small product stores within walking distance, bigger stores often require a trip into the city. This week, I needed to get to the Internet Café to upload some photos. Out of necessity, my stop was combined with a variety of other errands includinAg going to a fish market, bank, justice center, jeweler and eye doctor. For what might have been a “one stop” trip for me in Missouri, instead meant more than three hours of errands. Simply put, gas is expensive, even more so than in the states. Trips are not spent on frivolous requests. Instead, people make due with what can be purchased at the corner store until a larger trip can be planned. 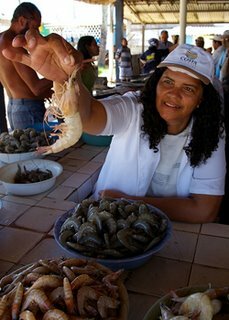 The visit to two of Maceio’s fresh fish markets was, to say the least, an experience. Bowls and containers of freshly caught fish of a variety of shapes and sizes, along with at least six types of shrimp lined the counters. The jumbo shrimp came complete with the heads and eyes--something you don’t see much of in Missouri. I just watched and listened as Janete and Greg bartered with the sellers for the right amount of shrimp. The guys staying here from Louisiana want to have a shrimp feast on their last night at the orphanage. Both shrimp markets lay next to Maceio’s shore line. One came complete with another unusual site--large cargo ships loading sugar from port-side warehouses. The Port of Maceio is one of the largest exporters of sugar in South America. It will be interesting to see how Wal-Mart will have an impact on the Brazilian economy. The most noticeable impact can be seen driving around Maceio and the surrounding area. Many merchants advertising accepting “Hipercards” or credit cards issued by Wal-Mart. Wal-Mart makes money two ways. It requires merchants to pay a percentage of sales customers make using the cards, and of course, it charges consumers an interest rate. Additionally, Wal-Mart has purchased two stores: Hyper, which is similar to its stateside stores, and Makro, a members-only store. A Sam’s Club is set to open in Maceio within the next month. 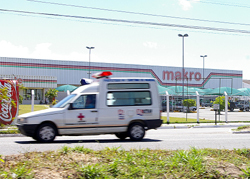 Greg Hailey, executive director of the boys orphanage, said much of the Brazilian population cannot shop at the Hyper or Makro, for a variety of reasons: one, the prices are too expensive, even the “Wal-Mart brand” and two, getting to the stores requires a car. 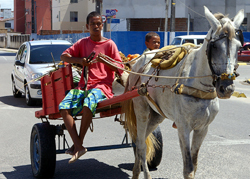 Many Brazilians living in the lower economic classes do not have vehicles, and instead use bicycles or walk to their destinations. Hailey said this is why street vendors and corner stores are plentiful in both the rural and urban settings. 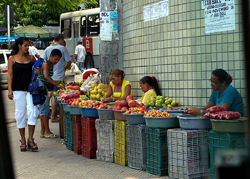 How Wal-Mart will change the Brazilian way of life is yet to be seen. In a country that is already divided dramatically by the “haves” and the “have-nots” it may be that instead of being a store for the masses, like in the states, Wal-Mart may become a destination for the upper class or those who are a step above poverty level.